This article is dedicated to my faithful Patrons who make my writings possible. A big welcome to Frank, Penny, and Meg! 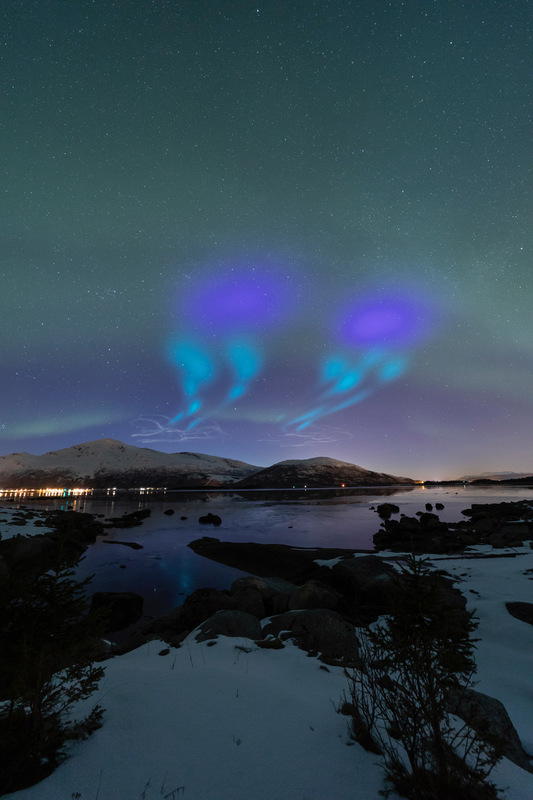 NASA has an AZURE project called Sounding Rockets that dumps some pretty nasty chemicals into the vertical circulation within the auroral zone which is the key element in the re-distribution of energy, momentum, and chemical constituents in response to forcing. The name of the sounding rocket mission is AZURE--short for Auroral Zone Upwelling Rocket Experiment. 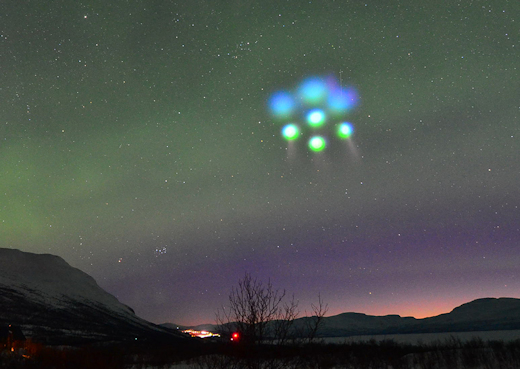 The result is a peculiar and unnatural phenomena light show in the sky. 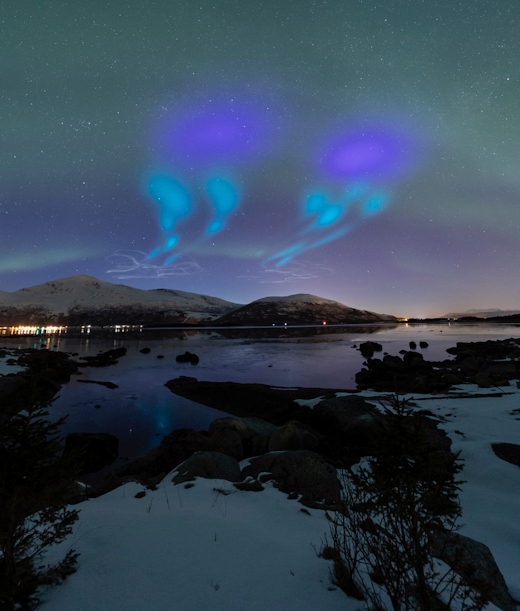 Last night, April 5th in Norway at Andøya Space Center launched two sounding rockets into a minor geomagnetic storm. The results were an alien sky after the rockets dumped chemical powders into the storm. Researchers ignited a stream of solar wind buffeting Earth's magnetic field. "It looked like an invasion of UFOs," says Chad Blakley. "Soon the glowing blobs evolved into more complicated structures--like two giant squid dancing in the northern sky with an impressive aurora display as its backdrop," describes Blakley. "These images are by far the most exciting I've ever seen it record." Two rockets released a payload of chemical tracers: trimethyl aluminum (TMA) and a barium/strontium mixture. These mixtures create colorful clouds that allow researchers to visually track the flow of neutral and charged particles, respectively. According to NASA, supposedly the chemical pose no danger to humans. Inquiring minds are not satisfied with NASA's positive spin so if you want the back story of this program and the side-effects of the chemicals they are dumping into the sky check out HODOR: A Time to Dye, when I brought this program to your attention. As we are beginning to see, with a handful of chemicals, one can make Lying Signs and Wonders, fire from the sky, pollute the atmosphere, bring untold global human side-effects, and fabricate an alien invasion- all rolled into one event. Coming soon, I will be returning to radio. My new show will be will Celestial Diamond Radio bringing you current news events with a biblical perspective.